In 2006, the Yaris made its U.S. debut. It was an immediate success thanks to it dependability and low cost of ownership. Eleven years later, the Yaris nameplate is still a favorite among commuter and city dwellers. The 2017 Yaris iA is a brand-new model for Toyota. It is available alongside the Yaris hatchback. Nomenclature can get kind of confusing, since Toyota also produces a Yaris hatchback. However, the iA sub-compact sedan is a totally different model. One thing that really sets the Toyota Yaris iA apart from the rest of the sub-compact crowd, is it’s styling. It’s impossible to overlook the dramatic waterfall-style grille, complimented by flowing body lines. The Toyota Yaris iA is only available in one, well equipped trim level. Standard equipment across the board includes cruise control, LED turn-signals, alloy wheels, Bluetooth, an audio system, 7-inch infotainment display and USB ports. The only optional equipment is dealer installed items such as a center armrest, a rear spoiler and navigation. Under the hood is where the Toyota Yaris iA packs a surprise. 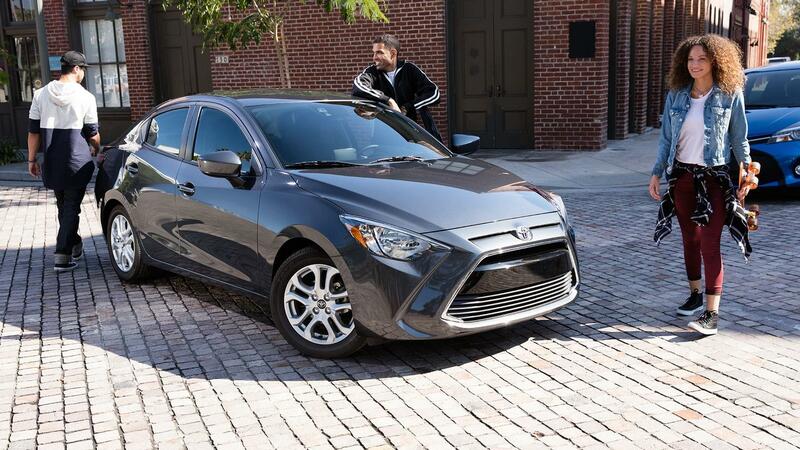 Unlike most subcompacts, the Yaris iA packs a punch. The 103-hp 1.5L four-cylinder engine provides more than enough power to scoot the little sedan through traffic. Transmission options include either a 6-speed manual or a 6-speed automatic. Power is set to the front wheels. Obviously, the Toyota Yaris iA was designed with economy in mind. The fuel efficient small sedan ekes out *30/39 mpg with the manual transmission and 32/40 mpg with the automatic. But, excellent performance isn’t sacrificed in the name of economy. On the contrary; the Toyota Yaris iA offers spirited acceleration and exceptional handling. It’s a car that is at home in city traffic or on a winding country back road. You’ll be safe in your Toyota Yaris iA, no matter where your adventures may take you. That’s because the Yaris iA offers a slew of safety features including antilock brakes, stability control, front-seat side airbags, side curtain airbags, traction and stability control, and a forward collision warning system with automatic braking. The pre-collision warning system is a laser-based system that scans the road at vehicle speeds up to 18 mph. If the system detects a hazard, it will warn the driver and automatically activate the brakes if needed. Sure, there are a lot of subcompact sedans on the road, but none of them offer the value and pleasure of the 2017 Toyota Yaris iA. The 2017 model is a great example of why the Yaris name has been synonymous with quality for over a decade.